If you've got a stock Solex carb, you don't need to do all the wild pumping. Just press on the accelerator lightly, which will release the automatic choke. The choke will do the business for you, if everything's in good shape. The mayo's due to lack of use and moist weather. Seals for what, BTW? I wouldn't worry about the mayo at the moment, its been explained why you have that. You should focus on the fuel issues, you don't want to risk a fire. I am curious about the carb you have which sounds like one for a Beetle, maybe I am wrong, and is it a reproduction or a genuine rebuilt solex? I assume your engine is a 1600 twin port. Someone will come on here and discuss your pancake filter which is not suitable. and would you give details of the distributor you have and if it has a vacuum can, you said it was points. perhaps you would take some pics of the engine and post them up here to get more interest and help. 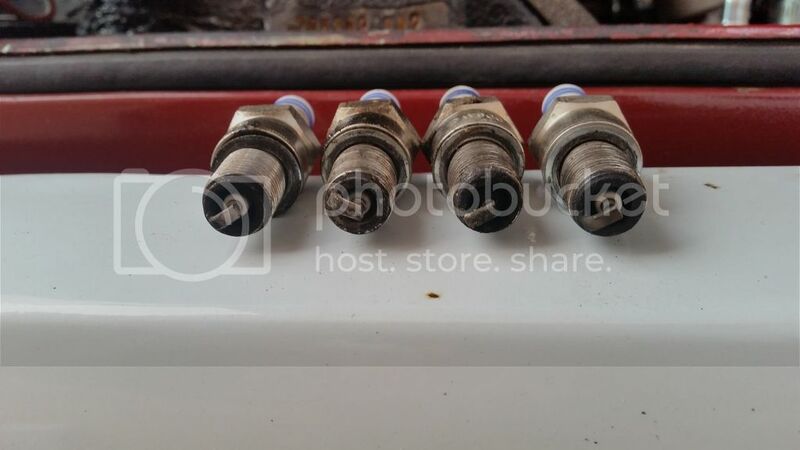 The sparkplugs are from right to left cylinders 1, 2, 3, 4. 1 looks about right, 2 appears rich, 3 slightly lean and 4 very lean. My bug get used very rarely and is going through an accelerator pump diaphragm every 12-18 months due to ethanol in fuel. First one lasted 30 years in my dads care. They are brittle and torn when replaced. On my third now. It will start but will bog down when the gas is applied. Rebuild kits are cheap but if the crab is new you have to ask yourself how long has it been sat on a shelf before being fitted. You’ve got a combination of the wrong carb and wrong dizzy. Aps, snotty and mgbman like this. Do you have a pic of the distributor and air filter. 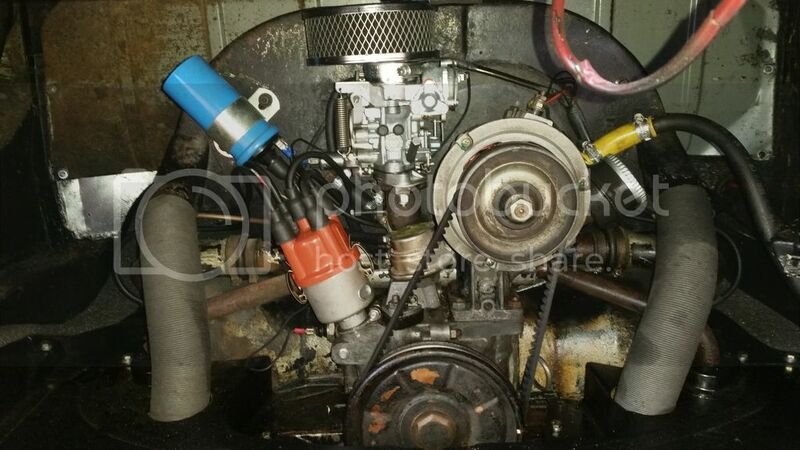 Run the engine and if its not too clattery you may be able to hear air leaks as a harsh hissing at idle .. or use a bit of hose, hold it to your ear amd poke the other emd round the carburettor and manifold. That carburettor is not doing you a favour when it comes to getting the correct mixture to the cylinders - too lean due to the carburettor originally being for a smaller engine, and it may end up with things overheating. The 3/4 side may well also have a leak - the rubber boot or the gasket between the cylinder head and the manifold may not be sealing. Today, the bus started very easily and I went round with wd40 and there appears to be no leaks. I tweaked the carb, went for a drive, everything seems to be good again. I wonder if poor starting technique lead to massive flooding. That may be. Until the next time it doesn't start. As advised by others, your engine is set up wrong, wrong carb, wrong distributor, wrong air filter and the plugs are past their best. The first 3 items you could do over time. Plugs need changing now. Is the engine battery old and worn out, I would get a new one and charge it up to maximum. Attend to the distributor points, clean and correct gap. Put new fuel in the tank, old fuel makes poor starting. Renew all fuel lines and breathers, new fuel filter under the tank outlet. Lots to do, but you will need to do them at some stage if you want safety and reliability. 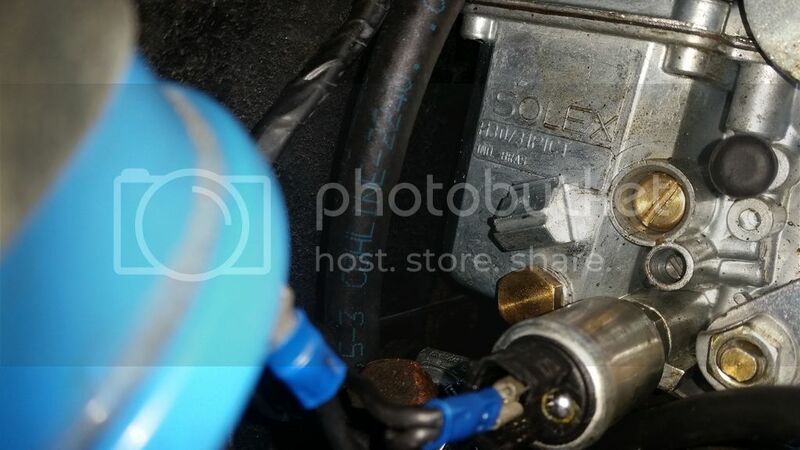 The wiring connections at the starter solenoid get corroded easily and cleaning them up all helps. As does the battery connectors and earth to body. Poor spark and weak spark may be a part cause of your erratic starting. Remember we are in winter and most engine non starts in winter are due to battery issues. I appreciate that the set up is wrong and I will be changing it as and when I find the bits ( already got a stock air cleaner) and plugs are on the way. The battery is less than 12 months old and was fine even with the considerable amount of cranking it did that morning, I did put it on charge after though. I have checked the valve clearances and adjusted one of them, checked and adjusted the points twice and am just waiting for a new timing light to come so I can check that. Fuel is fresh so that is out of the equation, and all the lines that I can see appear new, feel soft not brittle, no splits on the ends and are dry. I had a look through the paint lid and from what I can see the filler neck is good. I have a T piece for the tank breathers on order as that is shot. I am thinking that the reason it struggled to start was a combination of the very cold morning taking the edge off the battery and me flooding it. All this doesn't tell me how or where the fuel came from but I think the accelerator pump is the next thing to look at. Aps and mikedjames like this. An electrical spark or a leak of hot exhaust gas / flame will light petrol vapour if the mixture is right.. not too rich or too lean.. Petrol needs a temperature above 250 degrees C - sparks, exhaust pipes nearer heads but certainly not the engine block.